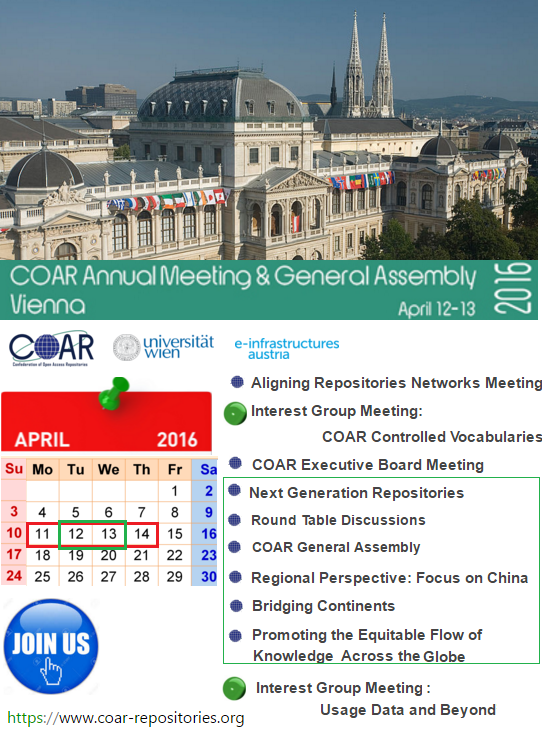 This year the COAR Annual Meeting and the General Assembly is hosted by University of Vienna. Use these last few days to register and to join the COAR International Community in Vienna! (here you can fill up the registration form). “COAR is an excellent opportunity to bring more visibility to regional and national initiatives on Open Access. It is also an ideal space for exchanging experiences and continuous learning about what institutions and countries are developing around the open access movement” (statement of a member in the last COAR survey). Open Access repositories are evolving in terms of the roles they play and the attributes they aim to express in their records. The mission of the Confederation of Open Access Repositories (COAR) is to facilitate greater visibility and use of research outputs through a global network of collaborative Open Access repositories that must be connected through policies, protocols, practices, and standard controlled vocabularies. To that end, COAR actively works towards the alignment of repository networks and other systems via technical and semantic interoperability, as well as common approaches to policy and services (see: COAR Roadmap Future Directions for Repository Interoperability). Each year, COAR holds a General Assembly, which is one of the most important opportunities for discussion and decision-making at COAR. The 2016 Annual Meeting (12-13 April) is hosted by University of Vienna, co-organized by COAR and University of Vienna, and organized in conjunction with the e-Infrastructures Austria. Besides a mix of workshops, conference sessions, round-table discussions and open dialogues offered by this year's COAR Annual Meeting, the programme also includes a number of pre- and post-meetings (11, 14 April) of COAR Executive Board, COAR Committee, COAR Working and Interest Groups. International Collaboration (focus on several collaborative projects being facilitated by COAR and discussion about what the community can do further promote the equitable flow of knowledge across the globe). There will also be a special overview of the current state of open science (Open Access and Open Research Data) in China. Social gathering opportunities will be part of the programme. The Interest Groups (IGs) Controlled Vocabularies for Repository Assets and Usage Data and Beyond will have the possibility to work together face to face to discuss a number of significant areas as well as the results achieved representing the interests and views of stakeholders from disparate research areas. is updated according to current open access indicators, and mapped with terms and concepts of related standard and widely used vocabularies (OpenAIRE Guidelines, NISO Access and License Indicators, RIOXX, CERIF Semantic Vocabulary, CASRAI Dictionary, etc.). The translated versions of each vocabulary element (term-definition) are connected via linked data principles. The COAR Resource Type Vocabulary has been successfully tested in EPrints software environment. The integration of the COAR Resource Type Vocabulary in EPrints ans DSpace open access software as well as in OpenAire (i.e. integration in e-Infrastructures) will be discussed in detail. The IG COAR Controlled Vocabularies will also address all matters relating to: dissemination and promotional activities; creation of support material for the current version; next steps towards Resource Type 2.0 and its feasibility. senior knowledge and information management officer at the Food and Agriculture Organization of the United Nations (FAO) - Imma Subirats. The Resource Type vocabulary is part of a set of COAR Controlled Vocabularies for the bibliographic metadata elements used in records describing research outputs. In the coming months the COAR Controlled Vocabularies Editorial Board will continue to focus its efforts on the updating of the Resource Type Vocabulary as well as to work on other COAR vocabularies (Publication Version, Project Identifier, Date Type, Access Level and License) that together will contribute to COAR’s broader objective to develop and maintain a set of international controlled vocabularies for Open Access repositories and ensure they are adopted widely. ensure international governance structure and an established workflow for maintaining the vocabularies in use by interested parties. COAR Controlled Vocabularies - when applied consistently – will offer a uniform standard terminology for describing content, assist with resource discovery, sharing and reuse of metadata and content, and promote mutual exchange of information on scholarly publications and research data among open access repositories, Current Research Information Systems (CRIS) and other types of infrastructure, e.g. academic search engines. by Agricultural Information Management Standards (AIMS) team under the FAO umbrella and by Global Open Data for Agriculture and Nutrition (GODAN) in the person of André Laperrière. All participants will have the opportunity to learn about international trends in open science and open access, engage with colleagues from around the world, and pursue collaborative projects with international partners. The discussions will lay the foundations for COAR's work in 2016-17, and will centre on new functionalities for repositories, value-added services and improving the flow of research knowledge. Source: COAR Annual Meeting 2016 Programme.